Whatever you do in Melbourne, DO NOT MISS THE MELBOURNE LANES and arcades! This is where the intimate Melbourne life happens. You could be rushing with the traffic along the major city streets and entirely miss these treasures, just hidden between the main CBD blocks. You will find quaint street cafes, hidden bars, some of the best Melbourne shopping at local designers, galleries, specialty shops and one-off boutiques in the Melbourne Lanes, selling things you would not find anywhere else. There is graffiti, smell of coffee, people-chatter and hustling activity, unassuming doorways, basements, upstairs lofts. The lot, from designer cool to bohemian. This is where Melbourne insider life and creativity take place. You can move through the entire city, from north to south via these laneways, without ever using a main street. 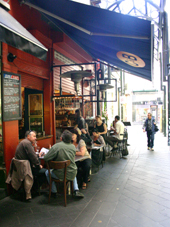 The Melbourne lanes are our choice for lunch or just walking through the city. 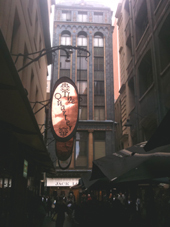 To explore the hidden Melbourne lanes we recommend (even for locals) one of the Melbourne walking tours. it is a good idea to take a tour. Otherwise you may miss the quaint shops and cozy cafes of the Melbourne lanes and arcades. 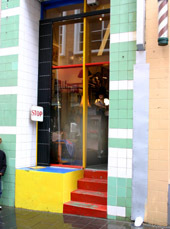 They will help you find local fashion designers, jewellers, intimate gallery spaces and basement bookstores. Only a small number of the over 180 of these small Melbourne lanes have been transformed into this most attractive city life. Many of them are still waiting to be discovered. They used to be the service lanes to the grand Melbourne streets of the late 1800s. Just opposite Flinders Street Station, between Flinders Street and Flinders Lane is Degraves Street. Half of this is covered by the umbrellas of the cafes and eateries. It is one of the most well known lanes in Melbourne. It is a hustle of activity, where you can have affordable lunch and great coffee. There is also an art and paper shop. Check out the underground access from Degraves Street to Flinders Street Station, where glass boxes with exhibitions by local artists line the underground walkways. This is not one of the tiny Melbourne lanes but a small street around which many laneways between Swanston and Elizabeth Streets are centred. There are fantastic shops and eateries, and the Majorca Building, an interesting Spanish style Art-Deco building with complex mosaic tile work at the end of Degraves Street. 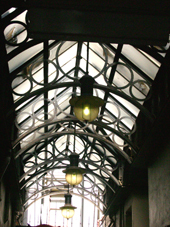 The Cathedral Arcade is in the historic Nicholas Building, on the corner of Swanston Street opposite the St Pauls Cathedral. The Nicholas Building is home to many Melbourne designers and artists and it is residence to many eclectic and unique shops. Parallel to Degraves Street, towards Swanston Street, is the Port Phillip Arcade and Scott Alley, which are a bit more hidden from the main traffic, and where you can find cheap eateries and specialty shops. On the other side of Flinders Lane is Manchester Lane with a number of interesting fashion designer shops and the cozy Manchester Lane basement jazz bar. Between Manchester Lane and Centre Place is a quaint arcade going through a building, with the post office, a barber, and a few other shops. 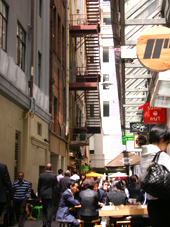 Centre Place, across Flinders Lane from Degraves Street, is one of the most frequently pictured Melbourne lanes. It is a narrow lane lined with tiny cafes, box seats, sidewalk-eating, upstairs bars. It is the epitome of Melbourne laneway life. There is the smell of coffee, soup, street art and lots of people. You can get lunch there for just a few dollars. A must-see lane! Take the stairs at the end of Centre Place and continue through the arcade to eventually come out on Collins Street. Cross the street and head left until you get the Block Arcade. 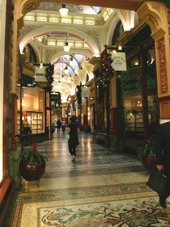 This is an up-market Melbourne arcade, where the wealthy during the Melbourne heydays promenaded the block. It houses stylish boutiques and cafes, and, with its mosaic floors and arched ceilings, is a treasure to explore. From there you get into Block Place, a covered narrow lane lined with eateries and cafes. It is one of the most romantic Melbourne places where you should linger and have a coffee. On the other end, you come out on Little Collins Street. 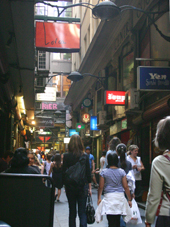 Like Flinders Lane, Little Collins Street is a small street with a number of fashion shops in this vicinity. Walking towards Swanston Street, you will pass Brown Alley and Carson Place before you get to Howey Place and Presgrave Place, a covered lane lined with many small designer fashion boutiques. Between the 1890s and 1920s this used to be part of Coles Book Arcade, which is said to have been the biggest bookshop in the world selling over two million books. From Howey Place you can continue through the Capitol Arcade to Capitol House on Swanstong Street. This opened in 1924 and was designed by the famous architects Walter Burley and Marion Mahony Griffin. It houses the, the Capitol Theatre, an extraordinary picture palace. Back down Little Collins Street, opposite Block Place, there is the 1869-constructed Royal Arcade, the oldest shopping arcade in Australia. It is elegant, with black and white chequered floors and stunning glass ceilings. It houses the mythical figures of Gog and Magog, two carved 7-feet giants flanking Gaunts clock. They are an 18th century British relic symbolising the conflict between the ancient Britons and the Trojan invaders. Gaunt was a watchmaker in the early Melbourne. 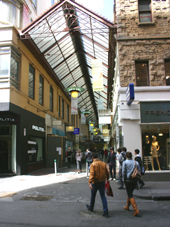 The Causeway, The Walk Arcade, Union Lane, Snugden Place & Mansons Lane are the other lanes between Little Collins and Bourke Street with eateries, street art and fashion shops. You eventually come out at Bourke Street Mall, where you find the Public Purse sculpture and the old GPO. This houses many up-market fashion boutiques. You can walk right through this and come out in Little Bourke Street. Alternatively, take a detour around Elizabeth Street where you can inspect the historic Underground Public Toilets that were built in the early 1900s. 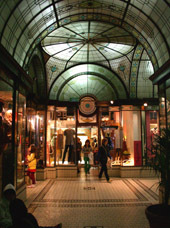 The networks of intimate Melbourne lanes end in the block between Bourke and Lonsdale Streets, as this is dominated by the Myers and David Jones department stores. 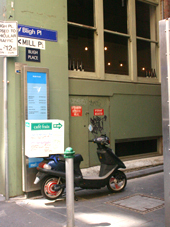 The lanes accessible from little Bourke Street are Angelo Lane, Staughton Place, Lynch Place, Arcade Alley and Caledonian Lane. From Caledonian Lane you can continue across Little Lonsdale Street through Drewery Lane and end up at the cone of Melbourne Central. There you'll find the back end of shops, locked gates, hanging pots and second-hand books. While Centre Place and Degrave Streets are the most popular Melbourne lanes, it can be difficult to get a seat there during lunchtime. However, just on the other side of Elizabeth Street, are a few very attractive and less well known lanes. This is one of my favourite places for lunch and street dining. It is off Little Collins Street, just past Elizabeth Street. Its special city street ambience, created by a large set of fire stairs, would fit a movie backdrop. A bit further up Little Collins Street is Flemington Place. 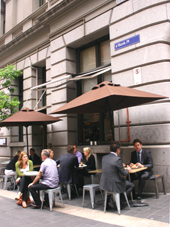 Further along Little Collins Street, across Queen Street you will find the Austral Lane and Bank Place. Bank place offers pleasant street dining and a tavern for the surrounding business community. Back across Queen Street, on you left you pass Penfold Place and then the Gallery Shopping Plaza, filled with many Melbourne retail specialty shops, and that takes you all the way through to Bourke Street. Head a little up Bourke Street until you get to the cobble-stoned Hardware Lane. This is the place for romantic laneway dining, live jazz and Mediterranean food, all under the canopy of marquees and umbrellas, with waiters in black and white inviting you to take a seat. This is also where you find many of the Melbourne ski and outdoor gear shops. The early 1900s warehouses that were originally home to blacksmiths, horses and the like in Hardware Lane and nearby Goldie Place are still intact, which makes this a more open and spacious lane. It is lit with Christmas lights and decorations in December. 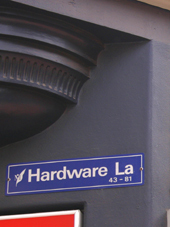 Hardware Lane continues as Hardware Street, all the way to Little Lonsdale Street. Down Little Bourke Street on your left is Niagra Lane. This has no eateries but a momentous group of 1880s warehouses with are picturesque barrel hoists. This goes all the way through to Lonsdale Street where you find the Niagara Hotel. On the other side of Little Bourke you pass Warburton Lane and then Somerset Place. This is a real insiders Melbourne lanes tip, with a very quirky bike shop and café, indeed a great place to hang out. Crossley and Liverpool Streets, and Meyers Place are small Melbourne lanes around Bourke Street, in the upper city end, between Exhibition and Spring Streets. These are insider tips for fine wining and dining with a number of chic restaurants and cafes. You also find some of the finest specialty boutiques in these side streets. ACDC Lane: between Exhibition and Russell Streets. Duckboard Place: between Exhibition and Russel Streets. Beaney Lane: off Russell St, between Collins St and Flinders Lane. Hosier Lane: between Russell and Swanston Streets. Rutledge Lane: between Russell and Swanston Streets. Bligh Place: between Elizabeth and Queen Streets. Commerce Way: between Elizabeth and Queen Streets. Flinders Court: between Elizabeth and Queen Streets. Highlander Lane: between William and King Streets. Club Lane: between Spring and Exhibition Streets. Meyers Place: between Spring and Exhibition Streets. Dame Edna Place, formerly Browns Alley: between Swanston and Elizabeth Streets. McKillop Street: between Elizabeth and Queen Streets. Cohen Place: in China Town, between Exhibition and Russell Streets. Celestial Lane: in China Town, between Russell and Swanston Streets. Bullens Lane: in China Town, between Russell and Swanston Streets. Rankins Lane: between Exhibition and Queen Streets. Racing Club Lane: between Exhibition and Queen Streets. Crombie Lane: between William and King Streets. Bennetts Lane and Jazz Club: between Exhibition and Russell Streets. Davisons Place: between Exhibition and Russel Streets. Evans Lane: between Exhibition and Russel Streets. Exploration Lane: between Exhibition and Russel Streets. Jones Lane: between Exhibition and Russel Streets. Manton Lane: between William and King Streets. Here is some research into the Melbourne Lanes by Andrew Webster, What is in a street name?, The Age, February 19, 2004. 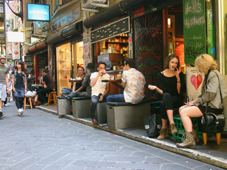 But Melbourne lanes and alleys offer a more down-to-earth record of the evolution of this city. The lanes really grew their own names, Professor Bate, president of the Royal Historical Society of Victoria, said. With some 115 entries, the society yesterday launched its first handy reference guide to the names of Melbourne streets and lanes. Aimed at visitors and Melburnians, the pocket brochure explains the origin of most city streets, lanes and alleys. According to Professor Bate, the early lanes sprang up as Melbourne settlers subdivided the big blocks between Sir Richards grand streets into more manageable units. Many lanes were filled with workers cottages. People often named them after pubs and hotels on corners, Professor Bate said. No fewer than 21 entries can be traced back to Melbourne gold-rush affection for alcohol. The favourite ofProfessor Bate, the cobbled Niagara Lane, lies nestled between well-preserved, red-brick warehouses off Lonsdale Street where the Niagara Hotel plied its trade. Later, as Marvellous Melbourne boomed, lane names recorded the burgeoning specialist trade areas and long-vanished businesses of the city: Hosier Lane off Flinders; Kirks Lane, once home to Kirks Horse Bazaar between Swanston and Queen Street; biscuit baker TB Guest and Co in William Street is remembered by the eponymous lane between Lonsdale and Little Bourke. The good city council decided they would have to change the names and so they became Liverpool and Crossley Streets, he said. But of course the brothels remained. Melbourne Streets and Lanes is available free from the society offices in A'Beckett Street (named after the first chief justice of Victoria, Sir William A'Beckett) and at the visitor centre at Federation Square.